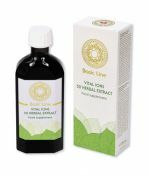 The application of our Vital-Ion 50 Herbal Extract could be called "magic from a teacup" and without any “magic” the ingredients of these plants, which have been scientifically proven to be therapeutic, work. The point of departure was the herbal tea recipes of the Taoist doctors who represent the pinnacle of the pyramid of the healer’s art in ancient China. These recipes have been compiled over centuries and have been tested on such a large number of patients unprecedented in the whole world. Not only in ancient China, but also in our part of the world, it is certainly no coincidence that the great herbalists such as Abbot Walafrid Strabo, the holy Hildegard of Bingen, the Dominican Albertus Magnus, and in recent times Sebastian Kneipp and Maria Treben, all spoke of "God’s Pharmacy". Further work and research was done on these recipes using the advantages modern technology. Changes were made according to state-of-the-art science and tested until the final version of the Vital-Ion 50 Herb Extract was found. The ingredients of the mixture and the proportions of the individual herbs are not coincidental but rather very accurately defined. The herbs in the mixture also have their exact place in the hierarchy, derived from their action and the area of application of the mixture. The herbs used for our Vital-Ion 50 Herbal Extract originate in the wild, taking cleanliness and hygiene into account. The most effective methods were used to obtain the syrup dependant on the desired active ingredient from the individual herbs. This was done by boiling, pulverising, steam distillation, cold extraction or other special methods. This resulted in a degree of efficacy that could never be achieved by normal infusion of a ready-made mixture of herbs, since the individual herbs release their desired active ingredients by different methods and also at different extraction rates and this is not possible with a teabag or tea strainer.